– Matthew 28:19, 20 ESV. Lovely Feet Ministries is and always has been dedicated to carrying out the work of the Great Commission. In Bolivia, that work is divided into two parts. The first part, or what we like to call the first step, is preaching, teaching and testifying about salvation by God’s grace through faith in Jesus. The second step is the discipleship process through the education of God’s word and the mentoring of a Christian walk with the goal of making disciples who then make more disciples. It is the passing on of the call to the Bolivian nationals. How then will they call on him in whom they have not believed? And how are they to believe in him of whom they have never heard? And how are they to hear without someone preaching? And how are they to preach unless they are sent? As it is written, “How beautiful are the feet of those who preach the good news! Romans 10:14, 15 ESV. 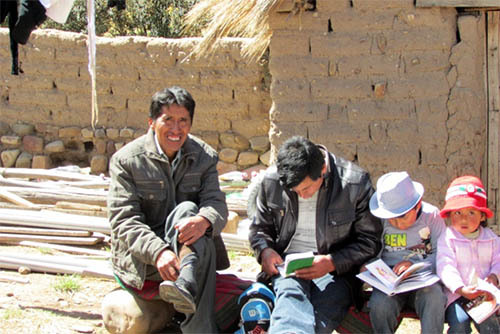 Lovely Feet Ministries began with the goal of preaching to the Aymara people in the Andean mountains of Bolivia. 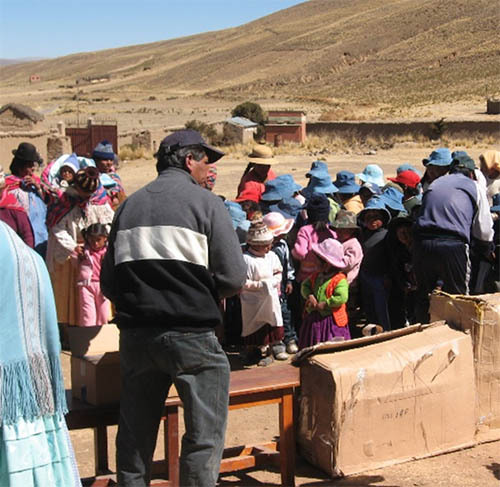 There were no foreign missionaries reaching out to the Aymara and only a handful of Bolivians ventured to the Aymara villages to share the love of God. We knew God was calling us to preach the Word to them. 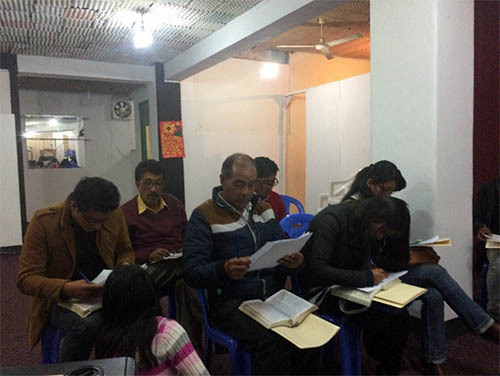 When we discovered that many Christians in Bolivia lacked essential teachings and understandings, we began teaching, strengthening, and encouraging the brothers and sisters in the city of La Paz and in the Altiplano. In the villages, we found many who had never heard of the name of Jesus. Village outreaches began by meeting the leaders and offering a day where we would bring medicine, doctors, clothes, school supplies and sometimes food. During these outreaches we would share the gospel of Christ and seek out those with a desire to know more about him. We would plan follow up visits to disciple new believers (more on that in step 2). It is through acts of kindness, the works of our faith, that doors were opened. It is our desire that through these deeds the Aymara people can see our faith and His love for them. So, the first step remains: Reach those that have not heard the gospel message and support our Christian brothers and sister where we find them. Step two is no less important than the first and in fact, one cannot succeed long-term without the other. The Great Commission does not ask us to make converts, but to make disciples. This is a process involving teaching not only the word of God but the way of God that is lived out as we walk with Christ and are transformed by the renewing of our mind through the Holy Spirit. Lovely Feet began this educational effort, writing and teaching a Discipleship manual called “First Steps” in the churches. This manual was designed to be more than just a class teaching scripture, it is also a step by step process to demonstrate the Christian life and spiritual formation. It is currently used in various locations in Bolivia. But more education is needed. It is why this year, 2018, LFM is launching a website in Spanish to teach lessons in the Bible for young Christians and new leaders. This need has birthed a new dream. LFM is in the beginning stages of a creating a Bible Institute to educate the Pastors into a deeper understanding and more profound relationship with our Lord. This is not simply a recreation of a system or institution, it is the contextualization of God’s Word into the Bolivian understanding. It is only through this kind of transformation that we will see faithful men and women who will be able to teach others also (2 Tim. 2:2). 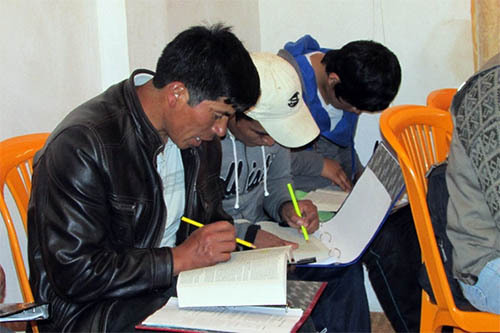 Without a firm foundation that penetrates the heart and transforms mind and life, the Bolivian people risk of not passing their faith the next generation. The Bolivian people must learn to read and understand the word of God in their own context and grow comfortable sharing the gospel with others in Bolivia until they all hear! Will you to walk with us in this vision? We don’t know where it originates, but there is a saying, “Look for where God is walking and grab on to his garment as He passes by.” Grab on with us!